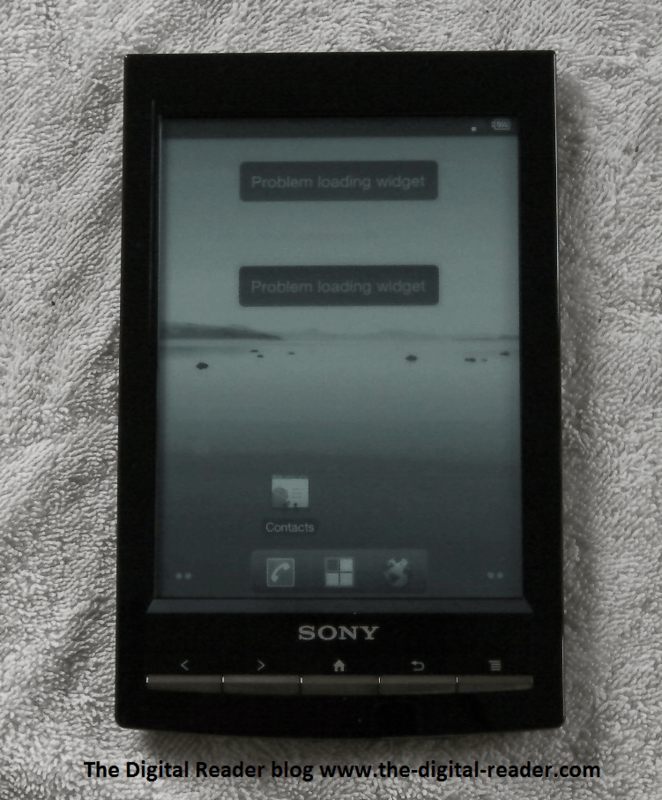 While I was busy recovering from CES this weekend, one Sony Reader owner discovered neat little trick. It turns out that there's a hidden screen refresh mode. Instead of the entire screen refreshing at once, the new mode allows for partial screen refreshes. This isn't going to be all that useful to a stock Sony Reader Wifi, but I would hope that you have already hacked your device. And it is a trick. This isn't something that you can enable in a menu; you have to be using the default web browser and catch it at just the right time. You can enable the partial refresh mode by opening the web browser and using pinch-zoom. Right after you do that, and before it has a chance to do full screen refresh, select the pull down menu from the top of the screen. If you're quick enough then you should be able to keep the mode when you exit and open another app. BTW, don't go back to Sony's home screen or the stock reading app. This will kick you out of the partial refresh mode. I've set aside my Sony Reader Wifi for the past few weeks while I reviewed other devices, and I cannot wait to get back to it. Underneath Sony's reading app lies Android v2.2 Froyo, and it only takes a simple hack to access it. Once you do, you'll have an Android tablet with a 6" E-ink screen, Wifi, microSD card slot,and limited support for third party apps (not enough room). I've taken to showing the Sony Reader Wifi off as my new Kindle. And now that I have this partial refresh mode, it's going to get a lot better. There is a whole community building around the rooted T1. This particular tweak makes screen refresh in some reading apps effectively instantaneous and while, as pointed out, running a stock app will restore full refresh, the trick survive multiple sleep cycles so if you read in the Kindle App or Coolreader, you need not see a black flash ever. It looks as if it drops to pure B&W; icons in Zeam launcher and the Coolreader control panel become almost useless blobs. Text quality in apps varies: Coolreader goes from laser-like sharp to slightly jaggie, Kindle Drop caps vanish, and Aldiko becomes unreadable. The rooting hack is trivial and wasn’t impacted by the recent (and atypical, for Sony) firmware update so Sony could save us all the need to track down these hacks and just sell the T1 as an eink Android Tablet with bundled Sony Reader. Nook and Audible install and run fine but I had to Triage them out. Other than wishing for a bit more app-install space and that the Homescreen and content manager apps were more useful for alternate reader Apps (fixes look like they’re coming) I see no need to get down and dirty to turn a T1 into the closest thing to a universal reader. Not bad for Sony’s first attempt in ages to compete on *value* rather than on brand loyalty. The method for extending app space using Link2SD discussed at the Wifi works fine. Google Market must run on the internal sdcard, but I have Link2SD to automatically install new apps to the SDcard. An eInk reader like this is not complete unless you have a RSS reader installed and Gmail! In addition to those apps, I have web browser shortcuts to three different Calibre libraries I have running as separate services. S/B discussed at the Wiki, not Wifi. Kindle+Coolreader+Aldiko’s OPDS is all I really need. The modded Homescreen would be nice but I can make do as is. If I could get custom OPDS working on Coolreader I might even ditch Aldiko. Right now, the rooted T1 does what my PB360 does plus it runs Kindle. There’s my value equation for this toy. Using the browser to check my email is just gravy. The TTS and the other things are cool but I have no use for them. Hmmm, not sure I believe you. I think like the rest of us, you want a multipurpose tablet that combines the best qualities of E-ink devices with an Android Tablet. Of course the Sony isn’t it it, but I can take this device to a coffee shop with me, and not miss my android tablet too much. My T1 is all about the ebooks. For other portability stuff I have the *color* Pocketbook IQ. Not sure about you, but my T1 is running Android 2.2.1 Froyo? You’re right. I blame CES; I have Gingerbread on the brain.